Doug Jones as Jonn Jonn'z. Well, sort of. I afraid to tell that this poster is just a fanart created by a certain artist in deviantART called daniel-morpheus. I really love his take on the team utilizing the latest designs and new ones for those who are yet to have movies like Aquaman, Martian Manhunter, Wonderwoman, and Flash. 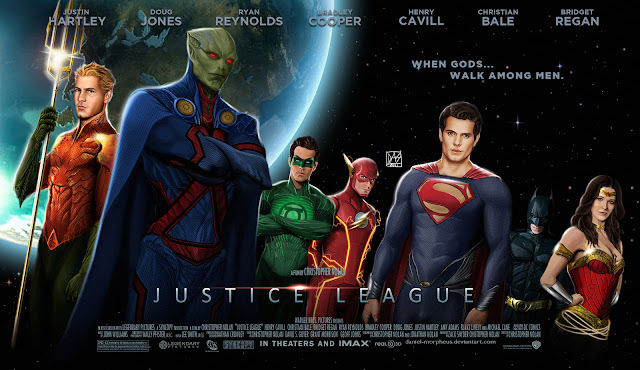 I admit it that a Justice League Movie could be far more epic compared to Marvel Comics' the Avengers but what really this franchise need now is a movie and they are being left behind by the competition. I really hope there is a decent writer that can come up with a brilliant idea for a Justice League movie and maybe DC fans can finally rejoice. As long as they can make individual films with good writers and creative directors ala Nolan and combined all of those characters into one dream DC fan film, then I will be as excited as you are with this one. Sadly, I heard a rumor that after the Dark Knight rises, they are going to make a new Batman film to fit to the Justice League film that they are planning. Hopefully it would come close to what Nolan has achieved with his Batman trilogy.